Many asteroids are in Earth-like orbits that offer accessible resources. Science fiction dreams of mining riches from asteroids only make sense if humans can make it worth their time and effort. The new Planetary Resources group backed by Silicon Valley billionaires and Hollywood moguls is now betting on the fact that there is big money in mining space rocks. "The near-Earth asteroid population could easily support 10 to 40 times the population of Earth, with all the necessary resources to do that," said John Lewis, a professor emeritus at the Lunar and Planetary Laboratory of the University of Arizona and author of "Mining the Sky." Even smaller space rocks can have mineral prizes worth tens of trillions of dollars. The smallest known metallic asteroid that is an accessible near-Earth object has 40 times as much metal as all the metal in Earth's history, Lewis pointed out. He has joined Planetary Resources as perhaps the most recognized expert on asteroid wealth. Knowing what asteroid wealth consists of depends on incomplete but enticing scientific surveys. 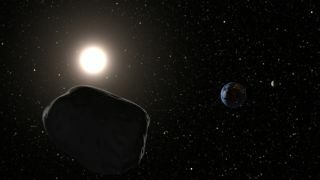 Scientists sitting on Earth can detect chemical signatures of asteroids based on reflected light, or directly sample space rocks fallen to Earth as meteoroids. Japan has carried out the only successful space mission to retrieve asteroid samples in space, but the U.S. is planning its own asteroid sample and retrieval missions. An M-class asteroid about 79-feet (24-meter) long could have as much as 33,000 tons of extractable metal and possibly one ton of platinum group metals. The platinum alone could be easily worth about $50 million dollars in Earth's commodity markets, according to studies cited by the paper "Assessment on the feasibility of future shepherding of asteroid resources" in the April-May issue of the journal Acta Astronautica. Such platinum-group metals represent the main prize for Earth markets, said Joan-Pau Sanchez, a researcher in the Advanced Space Concepts Laboratory at the University of Strathclyde in the UK. He coauthored the Acta Astronautica paper. "Platinum-group metals (PGMs) are likely to be the only material from asteroids that will prove economically viable to be transported back to Earth's commodity markets," Sanchez told InnovationnewsDaily. "PGMs are in high demand, and will be even more in the future." But the Planetary Resources group has its eyes on more than just platinum to strike it rich, Lewis said. He described using asteroid metals to build huge space stations or even space solar power stations for beaming energy down to Earth. That could come from the abundant S-class asteroids — about 40 percent of the near-Earth objects — which hold metals, semiconductors, and even oxygen or water. One 79-foot (24-meter) asteroid of the S-class could provide 1,100 to 4,400 tons of iron for building the structural support for a huge solar array capable of making a gigawatt of power (as much as a large power plant) for either space stations or Earth, according to the Acta Astronautica paper. A similar-size hydrated carbonaceous asteroid could hold a million liters of water (enough to fill half a million soft drink bottles). That would fall under the second big market envisioned by Planetary Resources — harvesting asteroid resources for use as rocket propellants, drinking water and oxygen to support space exploration missions. "The billionaires who are standing behind this right now are not doing this for fun and recreation," Lewis said. "They see it as a great economic value in the long run, and I'm not surprised if more than one wants to make a dime out of it."